Do you have a Revolutionary Patriot in your family tree? 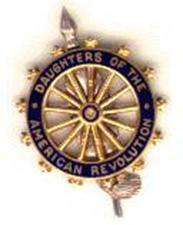 Membership in the Daughters of the American Revolution (DAR) honors and preserves the legacy of your Patriot ancestor. Over two hundred years ago, American Patriots fought and sacrificed for the freedoms we enjoy today. As a member of DAR, through participation in the Society's activities, you can continue this legacy by actively supporting historic preservation, promotion of education, and patriotic endeavors. Join us at one of our Saturday meetings and discover what's waiting for you. Select the Peter Forney Chapter Contact link. Leave your name, address, telephone number and a brief message. A member of the Peter Forney Chapter will contact you. 1. The DAR Insignia is the property of, and is copyrighted by, the National Society of the Daughters of the American Revolution. 2.Web hyperlinks to non-DAR sites are not the responsibility of the NSDAR, the state organizations, or individual DAR chapters.